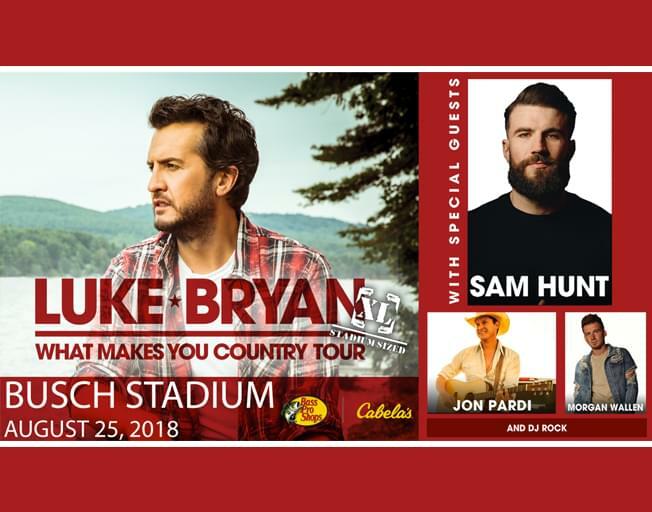 This Saturday (6/16) you have a chance to win a pair of tickets to Luke Bryan and Sam Hunt at Busch Stadium August 25th! From 11 am – 1 pm Saturday, join Hunter from ‘Faith and Hunter in the Morning’ at A.B. Hatchery for your chance to win the tickets. A.B. Hatchery will be holding a summer block party on Saturday. Complete with a food truck, cookies, and a sidewalk sale. Along with your chance to win tickets to the St. Louis stop of Luke Bryan’s ‘What Makes You Country’ tour. Sam Hunt, Jon Pardi, and Morgan Wallen will be joining Luke Bryan on this tour stop. Trust us, you don’t want to miss it! If you want to purchase tickets, click HERE. Don’t miss out on your chance to win these tickets Saturday! Hunter will be at A.B. Hatchery from 11 am – 1 pm giving you a chance to win. With Bloomington Normal’s #1 Country, B104!